A lot of cleverness goes into engineering the incredible, dependable, shrinkable Deep Underground Neutrino Experiment. The Deep Underground Neutrino Experiment, designed to solve mysteries about tiny particles called neutrinos, is growing by the day. More than 1000 scientists from over 30 countries are now collaborating on the project. Construction of prototype detectors is well underway. Engineers are getting ready to carve out space for the mammoth particle detector a mile below ground. The international project is hosted by the Department of Energy’s Fermi National Accelerator Laboratory outside of Chicago—and it has people cracking engineering puzzles all around the globe. Here are five incredible engineering and design feats related to building the biggest liquid-argon neutrino experiment in the world. 1. The DUNE detector modules can (and will) shrink by about half a foot (16.5 centimeters) when filled with liquid argon. Each of the large DUNE detector modules in South Dakota will be about 175 feet (58 meters) long, but everything has to be able to comfortably shrink when chilled to negative 300 degrees Fahrenheit (negative 184 degrees Celsius). The exterior box that holds all of cold material and detector components, also known as the cryostat, will survive thanks to something akin to origami. It will be made of square panels with folds on all sides, creating raised bumps or corrugations around each square. 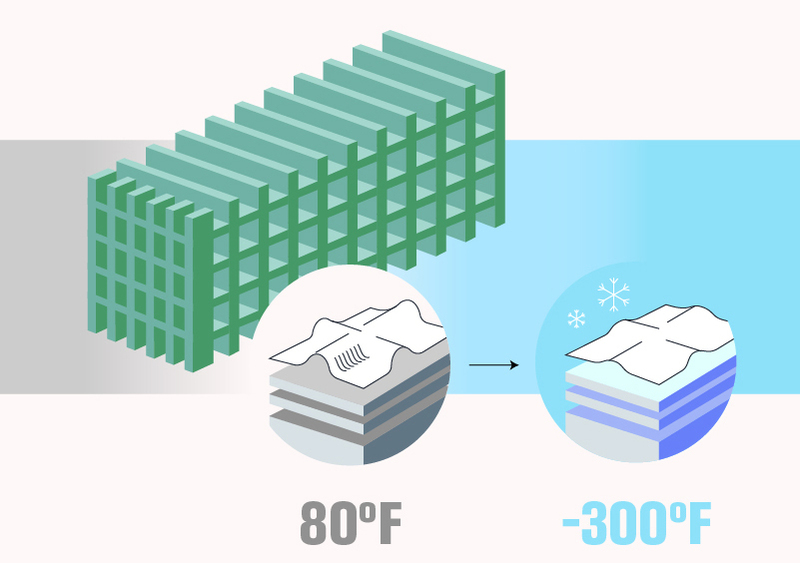 As DUNE cools by hundreds of degrees to liquid argon temperatures, the vessel can actually stay the same size because of those folds; the corrugation provides extra material that can spread out as the flat areas shrink. But inside, the components will be on the move. Many of the major detector components within the cryostat will be attached to the ceiling with a dynamic suspension system that allows them to move up to half a foot as they chill. 2. Researchers must engineer a new kind of target to withstand the barrage of particles it will take to make the world’s most intense high-energy neutrino beam for DUNE. Targets are the material that a proton beam interacts with to produce neutrinos. The Fermilab accelerator complex is being upgraded with a new superconducting linear collider at the start of the accelerator chain to produce an even more powerful proton beam for DUNE—and that means engineers need a more robust target that can stand up to the intense onslaught of particles. Current neutrino beamlines at Fermilab use different targets—one with meter-long rows of water-cooled graphite tiles called fins, another with air-cooled beryllium. But engineers are working on a new helium-gas-cooled cylindrical rod target to meet the higher intensity. How intense is it? 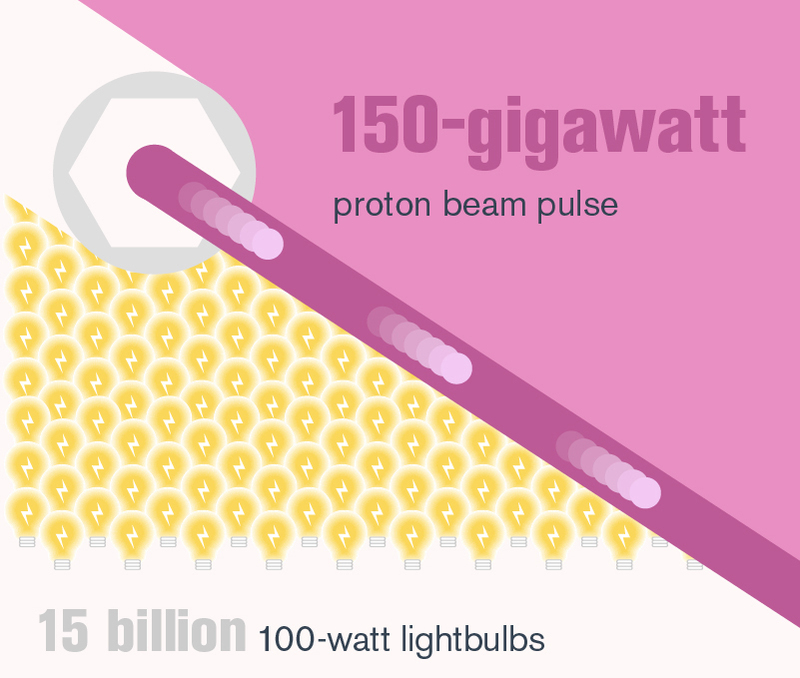 The new accelerator chain’s beam power will be delivered in short pulses with an instantaneous power of about 150 gigawatts, equivalent to powering 15 billion 100-watt lightbulbs at the same time for a fraction of a second. 3. 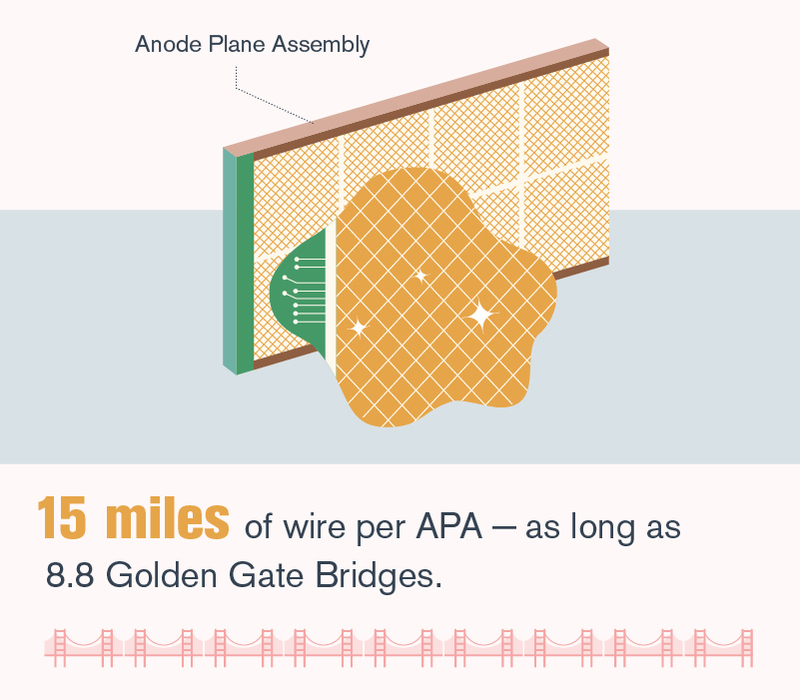 A single DUNE test detector component requires almost 15 miles of wire. Before scientists start building the liquid-argon neutrino detectors a mile under the surface in South Dakota, they want to be sure their technology is going to work as expected. In a ProtoDUNE test detector being constructed at CERN, they are testing pieces called “anode plane assemblies.” Each of these panels is made of almost 15 miles (24 kilometers) of precisely tensioned wire that has to lay flat—within a few millimeters. The wire is a mere 150 microns thick—about the width of two hairs. This panel of wires will attract and detect particles produced when neutrinos interact with the liquid argon in the detector—and hundreds will be needed for DUNE. 4. DUNE will be the highest voltage liquid-argon experiment in the world. The four DUNE far detector modules, which will sit a mile underground at the Sanford Underground Research Facility in South Dakota, will use electrical components called field cages. These will capture particle tracks set in motion by a neutrino interaction. 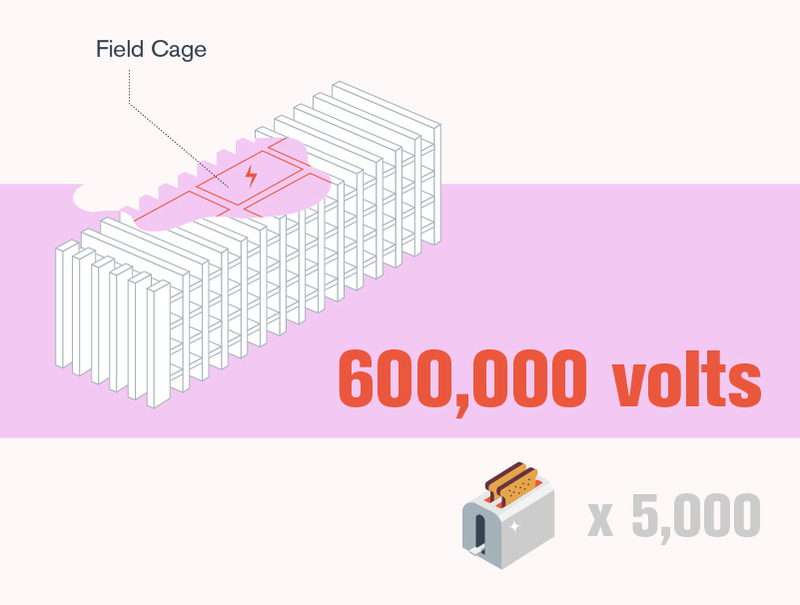 The different modules will feature different field cage designs, one of which has a target voltage of around 180,000 volts—about 1500 times as much voltage as you’d find in your kitchen toaster—while the other design is planning for 600,000 volts. This is much more than was produced by previous liquid-argon experiments like MicroBooNE and ICARUS (now both part of Fermilab’s short-baseline neutrino program), which typically operate between 70,000 and 80,000 volts. Building such a high-voltage experiment requires design creativity. Even “simple” things, from protecting against power surges and designing feedthroughs—the fancy plugs that bring this high voltage from the power supply to the detector—have to be carefully considered and, in some cases, built from scratch. 5. Researchers expect DUNE’s data system to catch about 10 neutrinos per day—but must be able to catch thousands in seconds if a star goes supernova nearby. A supernova is a giant explosion that occurs when a star collapses in on itself. Most people imagine the dramatic burst of light and heat, but much of the energy (around 99 percent) is carried away by neutrinos that can then be recorded here on Earth in neutrino detectors. On an average day, DUNE will typically see a handful of neutrinos coming from the world’s most intense high-energy neutrino beam—around 10 per day at the start of the experiment. Because neutrinos interact very rarely with other matter; scientists must send trillions to their distant detectors to catch even a few. 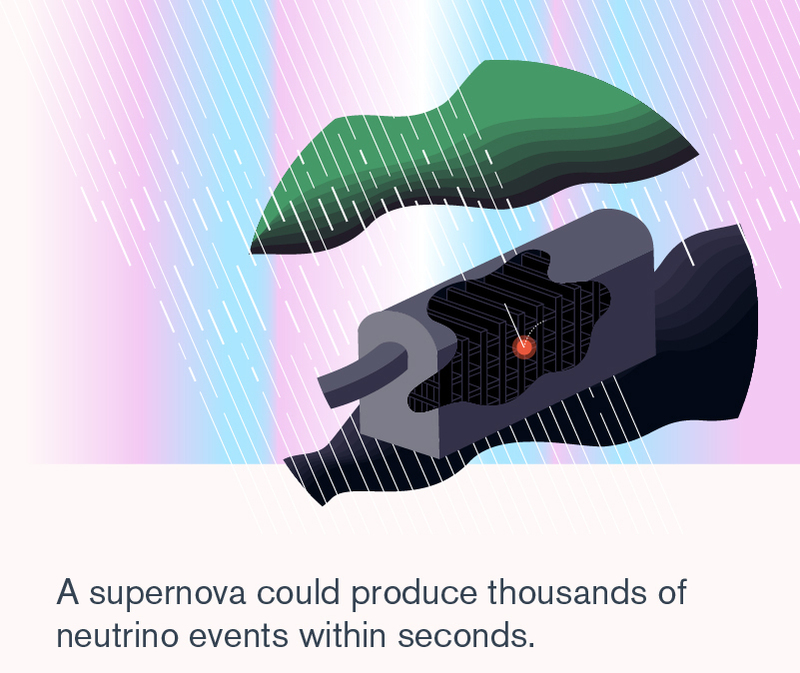 But so many neutrinos are released by a supernova that the detector could see several thousand neutrinos within seconds if a star explodes in our Milky Way galaxy. A dedicated group within DUNE is working on how best to rapidly record the enormous amount of data from a supernova, which will be about 50 terabytes in ten seconds.